Wikipedia is the encyclopedia anyone can edit, and thousands of people around the world do just that. But all too often, cultural knowledge is locked behind a language barrier. Haruki Ikeda is an example of a student working to break down that wall, and he’s opening up knowledge about a rich cultural tradition in the process. Haruki (User:Decafespresso) is a student in Dr. Amy Hughes’ two-term theater history course at Brooklyn College. While he was interested enough to create an account on Wikipedia in 2009, he hadn’t made an edit until he started the course. Since then, he worked on two articles over two terms, contributing to the article on Noh, a traditional Japanese theater form that was rated a Good Article. Then, he began working on the article for the Broadway League. In his first round, the Noh article, Haruki drew from Japanese sources that weren’t available in English. He was born in Tokyo, and Japanese is his first language. For Noh, Haruki helped edit as the article expanded from 8 sources to 41, with at least three Japanese-only texts. The article was named a Good Article three months after Haruki helped expand it (with very few additional edits in between). His second article required a completely different approach. For that article, Haruki added over 20 sources about the Broadway League, a trade association for theater actors on Broadway. Haruki added information about strikes and the political activity of the organization dating back to the 1940s. Haruki said he hopes to spend more time translating Japanese articles and sources for the English Wikipedia. After all, that’s in line with his long-term goals: He wants to bring more awareness of contemporary Japanese performances to the West. Haruki’s work is an example of what’s possible when a bilingual student, already fluent in English and another language, tackles a classroom assignment. Students who are still mastering a language, however, can also make meaningful contributions to Wikipedia through translation assignments. By working with articles in their target language and translating it into their native language, students can unlock knowledge from other language Wikipedias and share it with the English-speaking world. (You can read more about translation assignments here). 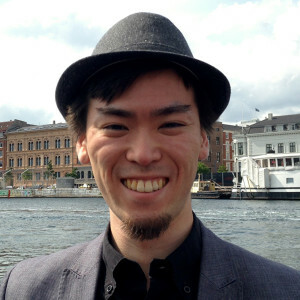 Thanks to Haruki Ikeda for his wonderful contributions to Wikipedia. Photo of Haruki Ikeda By Decafespresso (Own work) [CC BY-SA 4.0], via Wikimedia Commons. Mask photo, “Three pictures of the same noh ‘hawk mask’ showing how the expression changes with a tilting of the head” by Wmpearl – Own work. Licensed under Public Domain via Wikimedia Commons.